Located on Ebrington Street Opposite Hangry & the Bread & Roses Tec Team is an independent and family run business. We are dedicated to providing a excellent customer experience. We will never charge for a repair that was unsuccessful, this excludes our water damage cleaning service. We do not charge for diagnostic works on Apple or PC Laptops and Desktops, including internal parts. 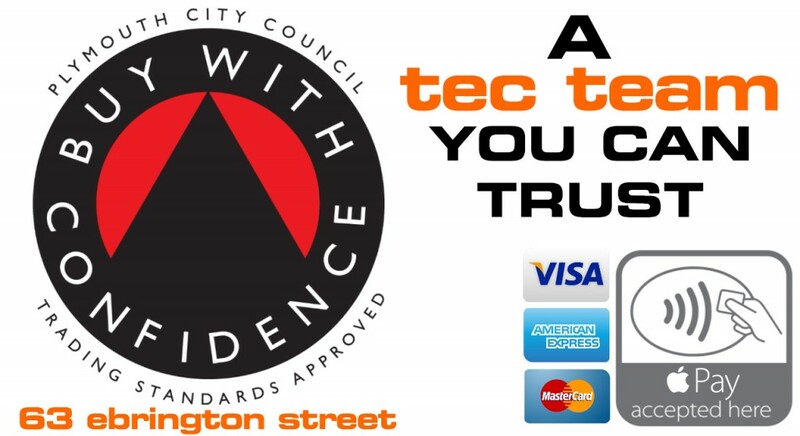 Tec Team is a member of the local council Buy With Confidence scheme. We specialise in repairs for all computers, the Apple iMac requires expertise and we are proud to have the experience and expertise to perform these repairs to both new and vintage Apple iMac in Plymouth, Devon and Cornwall. We specialise in repairs for all computers, the Apple Macbook Pro Laptop requires expertise and we are proud to have the experience and expertise to perform these repairs to both new and vintage Apple Mac book laptops in Plymouth, Devon and Cornwall. Not all laptops are the same, at Tec Team we have worked on many types and all the brands including Apple, Dell, HP, Asus, Lenovo, Acer, Toshiba & Sony Vaio. We repair and upgrade them everyday for customers in Plymouth, Devon & Cornwall. Not all PC’s are the same, at Tec Team we have worked on many types and all the brands including Dell, HP, Asus, Lenovo, Acer, Toshiba & Sony Vaio. We repair and upgrade them everyday for customers in Plymouth, Devon & Cornwall.